Daisy Farish and Elation are the Gotham North Small Pony Hunter Champions during the fourth week of the 2011 FTI Winter Equestrian Festival. Photo © Sportfot, Official Sport Photographer of the FTI Winter Equestrian Festival, www.sportfot.com. 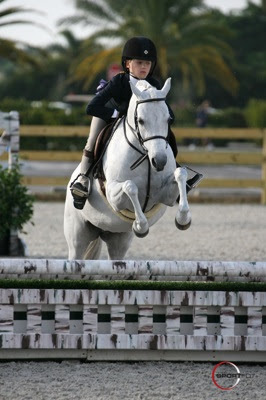 Wellington, FL - February 6, 2011 - As the weekend comes to a close, numerous championships were awarded in the pony hunter divisions. The FTI Winter Equestrian Festival, which runs through April 3, hosts some of the fanciest ponies in the country. Today, the Gotham North Small Pony Hunters were among those awarded. Loads of spectators, including many pony riders and their accompanying family members, filled the areas surrounding the pony rings, or "The Island" as the regulars have dubbed it. Young kids were up bright and early getting to work with their ponies in the show ring. Daisy Farish was one of those riders whose hard work was rewarded. Farish won top honors in the Gotham North Small Pony Hunters aboard Betsee Parker's pony, Elation. Elation is an eleven-year-old Welsh Pony mare by Kilvey Taran. Farish explained that her pony is easy and fun to ride. "She's very quiet and she likes to stay slow." She went on to add that Elation's favorite treats are apples. The winning duo secured their tricolor award by winning two of the division's five classes. They also placed fourth in two other classes. Today the small ponies had two over fences classes, one of which was a handy hunter class. Some of the riders had never done a handy course before, and expectedly had difficulty remembering the unusual course. However, Farish and Elation had no trouble at all, as that was one of the classes that the pair won. When asked about the trot fence in the handy course today, Farish explained that it was no problem, "Elation comes down to the trot really well for the trot jumps!" Reserve champion in the Gotham North Small Pony Hunter division was awarded to Bergen Sanderford riding the Margot Bay Farm entry, Made For Me. Made For Me is a twelve-year-old Oldenburg gelding by Courage. The duo won a class and was third in a class to secure the reserve championship honors. Stay tuned next week as the hunters begin competing for a spot in the WCHR Hunter Spectacular. Divisions should be the biggest yet for the 2011 FTI Winter Equestrian Festival as riders aim to secure their place in the Week 6 night class line-up.